Can Kavanaugh Be Kept Off the Supreme Court? Why there’s a glimmer of hope among the high drama of his congressional hearings. Thursday’s Senate hearing on the nomination of Brett Kavanaugh to the U.S. Supreme Court lasted late into the night, just as it had the night before. And while hearings for Supreme Court nominees are always high theatre, this one has been a stand out. Starting with the nominee himself, who polling shows is the least popular Supreme Court nominee since Harriet Miers was nominated by George W. Bush in 2005. That’s because Judge Kavanaugh, who already sits on the DC Circuit Court of Appeals, is a rarity in the world of appellate court judges: he has a long history and paper trail of musings on a multitude of controversial issues that may very well come before him, were he to fill the seat vacated by Anthony Kennedy. 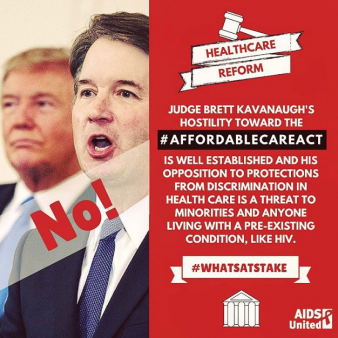 His appointment once seemed inevitable, given the Senate’s Republican majority and Senate Majority Leader Mitch McConnell’s (R-KY) elimination of the filibuster for Supreme Court nominees as a Senate procedure last year. But the progressive community has come out in force opposing Kavanaugh’s appointment and as the controversy around the Mueller investigation continues to undermine the President, Democratic senators saw an opening. Given the increasing likelihood that the Supreme Court will at some point consider a case involving the current investigation into President Trump by Mueller, is it appropriate to let the President select one of the justices that would decide that case? For their part, Senate Republicans have done their best to ram through Kavanaugh’s nomination. Sen. Chuck Grassley (R-IA) gave extraordinarily little time to his Democratic colleagues to review the nominees extensive record of opinions and articles, while classifying vast amounts of them confidential and off limits for public scrutiny. This spurred perhaps the most dramatic scene of the last three days. Sen. Cory Booker read aloud from an email including comments by Judge Kavanaugh about racial profiling that had been deemed confidential, and then challenged his colleagues in the Senate to expel him for doing so. Instead of taking punitive action against Booker, Sen. Grassley chose to release that email along with several others, spurring fierce questioning of the nominee Thursday. In the emails, Judge Kavanaugh, who at the time worked in the Bush administration, referred to some Transportation Department regulations to assist minorities as a “naked racial set-aside.” He also referred to programs aimed at assisting Native Hawaiians as a “naked racial spoils system.” A point that Sen. Mazie Hirono from Hawaii took issue with, and noted might also be applied to Native Alaskans. Will all of this translate to the defeat of Kavanaugh’s nomination and yet another humiliating blow to for the Trump administration? It’s too soon to tell. But the odds certainly seem much higher today than they did three days ago. Write your senator today and tell them to oppose Kavanaugh’s nomination, and we will continue to monitor for developments and our readers posted as they arise.